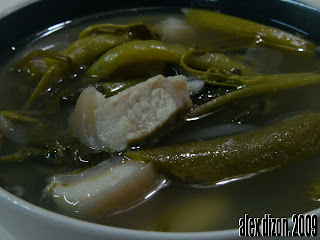 Home / baboy / filipino dish / food / sinigang / sinigang na baboy / soup / One hot Sinigang na Baboy, coming up! One hot Sinigang na Baboy, coming up! Plus, the thought of I haven’t done any productive thing in the office really adds negative vibes to my system. It’s so depressing. Then, as I arrived home, the sad thoughts (well, not all, but a lot) were washed away by the aroma of the dish that I’m very aware of. Thanks to my Ermats for this very wonderful dish! After eating, I had this very BIG TUMMY! I think I had 4 cups of rice! My gosh! And I’m still carving for more! Lols! I believe that my mind was also bloated already after this meal, that those sad thoughts earlier hadn’t some space to stay in mind. The hot salty/sour soup, the perfectly cooked vegetables and the juicy meat really crawls to my system and created endorphins that made me happy. 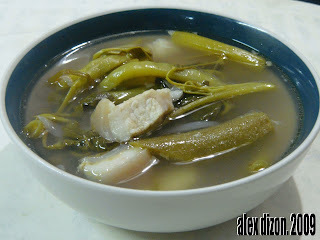 I just love a Sinigang na Baboy when you can really taste the combined sour tamarind and the salty flavour of the meat And my Ermats does it very well, ALWAYS! And the best way to enjoy more this dish is to have a saucer, put that big green chilli on it, smashed that chilli with your fork, add fish sauce, then every time you’ll take a bit of the meat or the vegetable, dip it first in to that sauce and take a spoonful of hot rice. Oh, sooooo yummy! And if you’re high blood stay away from those fat and too much rice, instead, just enjoy the soup! Lols!